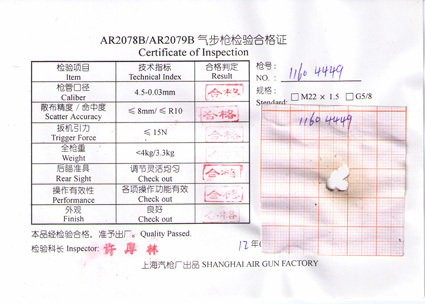 We test most of the Shanghai Airgun Factory manufactured guns - such as the QB78 and QB57 with "The Peak" wadcutter pellets. 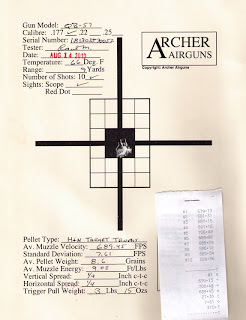 These give generally good results with most airguns with a muzzle velocity of less than about 800fps and we use them as a good general purpose pellet for Archer Airguns Gold Service testing. But recently, Paul tested a QB57 air rifle and "just knew" that it could do better than the group he had achieved. 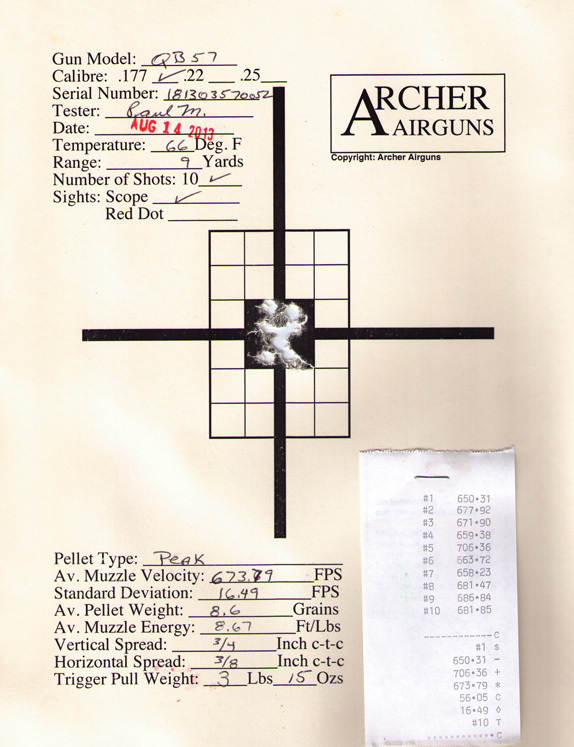 So he tested the same gun with Stoeger X-Field pellets (re-branded H&N Field Target Trophy). Below you can see the results. Same shooter, same distance, same gun, same number of pellets fired in each string, consecutive shot strings, just different pellets. Paul was absolutely right. 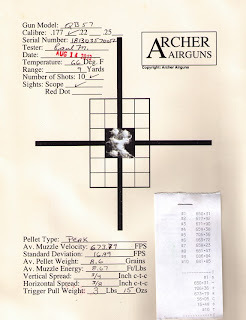 That QB57 could shoot better than the first test showed! This is a simple example that shows why it's very worthwhile to experiment with different types of pellets in your air rifles. Every airgun is an individual and will have its' own preferences. You just have to find the pellets it prefers! I'm delighted to see that the latest post on the Crosman corporate blog - Croswords - features Archer Airguns! 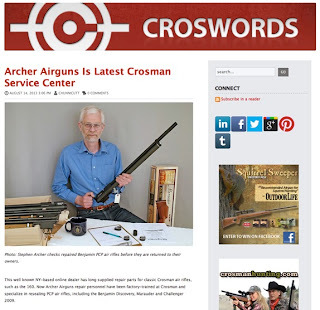 The Crosman blog post features Archer Airguns' repair services, obviously highlighting the fact that we specialize in reseals to Crosman PCP air rifles, including the Benjamin Discovery, Benjamin Marauder and Crosman Challenger models. Doug and Mike are the primary specialists for Archer Airguns repairs - so you'll probably see one of their names on the documentation that accompanies your repaired airgun - although I check every repair personally before it's returned to its owner. 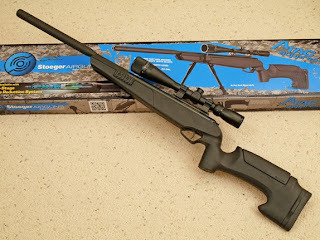 All three of us (Mike, Doug and I) are Crosman factory trained and Archer Airguns uses jigs identical to those used on the Crosman production line to ensure that O rings are not inadvertently torn when reassembling these PCP air rifles. Archer Airguns plans to introduce more repair services in the future for more Crosman airguns. 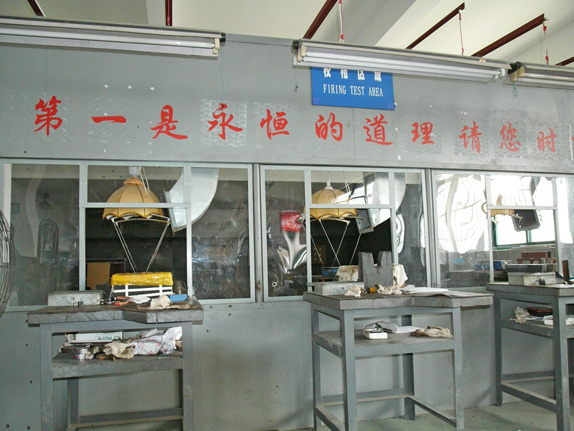 Check out our Repair Services page for more details. 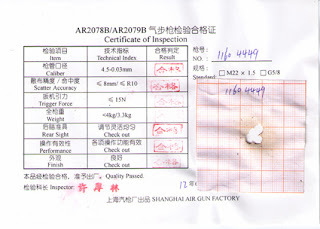 Both the AR2078B and AR2079B air rifles are tested for accuracy at the Shanghai factory and each of these guns ships with this factory test target. 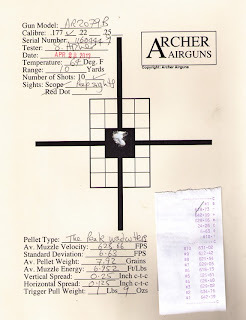 In a previous blog, I've posted test targets for the AR2078B, so this post shows how a sample AR2079B performs. 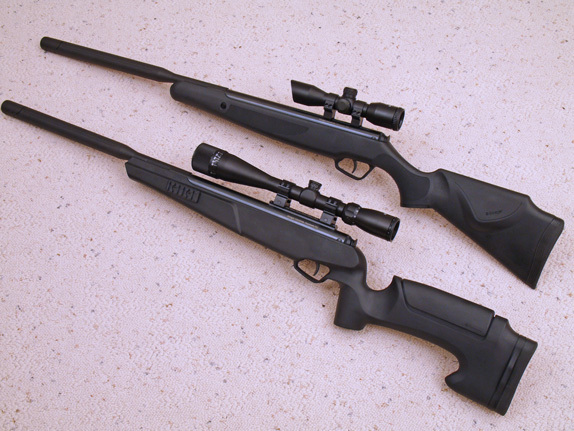 The AR2078B and AR2079B are actually very similar airguns. Both are sidelever cocking target rifles with sophisticated aperture - or peep - sights that are based on the QB78 and powered by CO2. The main difference is that the AR2078B uses two x 12 gram Powerlets for propulsion, while the AR2079B accepts a paintball tank in just the same way as the QB79. 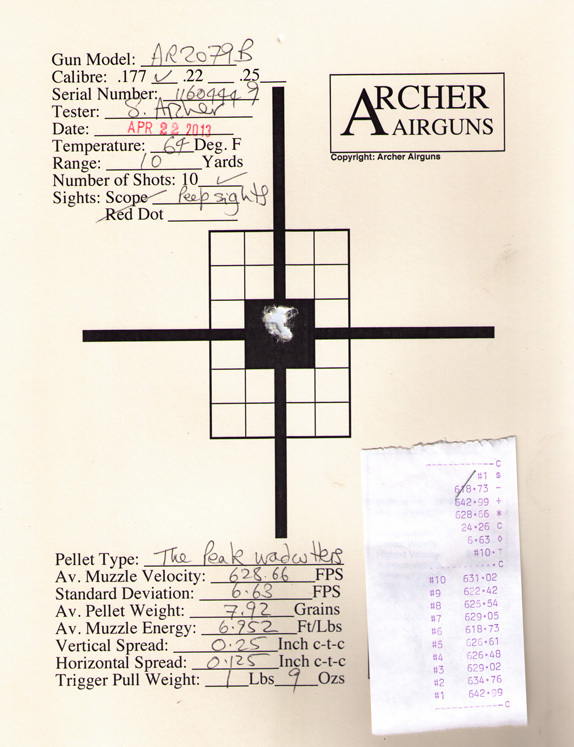 Here's the factory test target for an AR2079B. 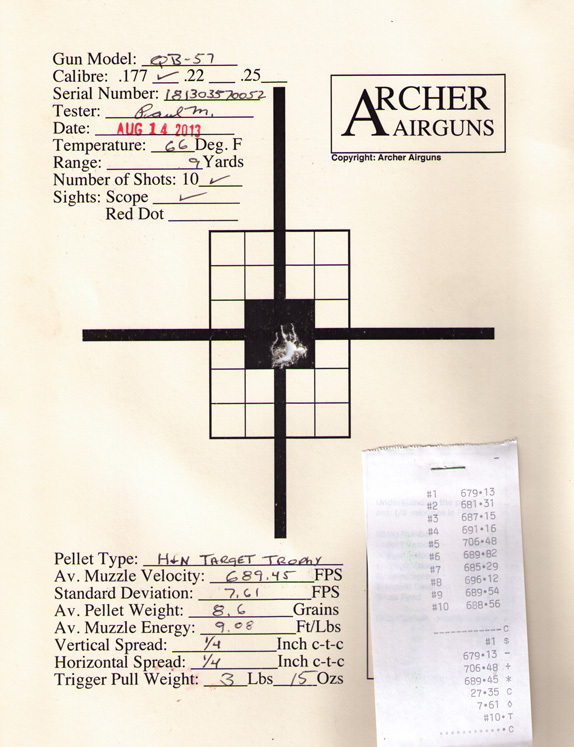 Below we see the Archer Airguns Gold Service test target for the same air rifle. The shooting is very similar, as you can see. The Shanghai factory test targets are shot on the 10 meter range on the second floor of the main factory building in the QA department. This is it, below. As my photograph was taken during the workers' Lunch break, I was able to have a clear shot of their setup. Note that the range is equipped with chronographs and a lead dust extraction system (the air intakes above each shooting position). It's a very nice arrangement and I loved the lampshades above the Chronies!